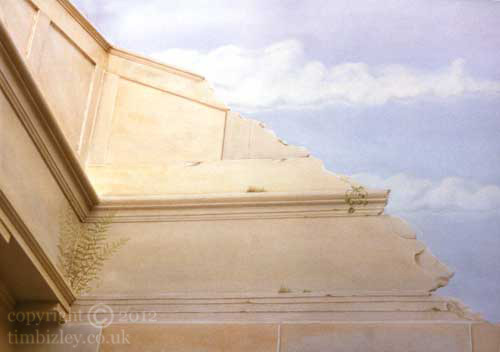 In order to incorporate the extant architecture into the mural itself trompe l'oeil painting techniques have been employed to give the suggestion that the stone cornice and other elements return accross the wall before succumbing to the ravages of time and weather. Muralists and decorative artists are often required to balance architectural elements that are either incomplete or entirely missing, whether incorporated in a wall mural or not. This serves to re-instate balance and harmony into a room or design scheme. In grander designs the entire architecture of the wall might be established in paint in a technique termed 'quadratura'. Indeed this art was so popular in the seventeenth and eighteenth centuries that a skilled group of traveling artisans developed known as the 'quadraturisti'. Tiepolo often employed such an architectural trompe l'oeil specialist for parts of his paintings. This technique is an expedient method of adding interest and richness to an interior in a fairly unobtrusive way because these effects are usually executed in grisaille and are receding by nature.